Congratulations! Your big day has finally arrived and your braces have been removed. We know you are excited and proud of the effort you’ve put forth to achieve your new smile; but, your work is not finished. Your teeth must be retained, or held in their new positions until the bone, gums, tongue, and lips have adapted themselves to the new positions of your teeth. If you did not make an effort to retain the teeth following their orthodontic movement, they would tend to move back to their original positions. You have been fitted with delicate plastic appliances called Retainers, which are custom designed and constructed for each patient. Retainers must be relatively thin in order to have a minimal effect on speech, and so must be handled with care to avoid breakage. While your first set of retainers are included in your original fee, an additional charge will be made for lost or broken retainers or for replacing retainers that do not fit properly due to improper wear. Your teeth may be uncomfortable for a couple of days, similar to when your braces were adjusted. Speech may be affected for a short period of time while you adapt to wearing your retainers. During the first six months: wear the upper and lower retainers for 24 hours (unless instructed otherwise by Dr. Song). After six months, wear both retainers nighttime only (unless instructed otherwise by Dr. Song). A fine emery board can be used to smooth rough or irritating edges. Remove your retainers for eating, brushing, flossing and for athletic activities which may jar your retainers out of your mouth. While wearing the retainers, do not chew gum. It sticks to the plastic. Keep your retainers clean. While brushing your teeth, brush your retainers with toothpaste and cool water. They should be cleaned with Denture Cleaner once a week. Dishwashing liquid and vinegar water are also good cleaning agents. When not in your mouth, always place your retainers in their case. Never leave them lying around or wrapped in a tissue. Never place your retainers in hot water or near a hot surface, or leave them in your car on a hot day. The heat will warp the plastic causing them not to fit properly. Pets love to chew on retainers! Keep them out of their reach. 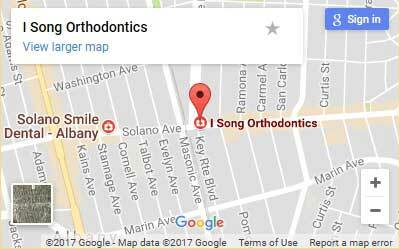 Bring your retainers to each appointment. If lost or broken, call our office immediately.